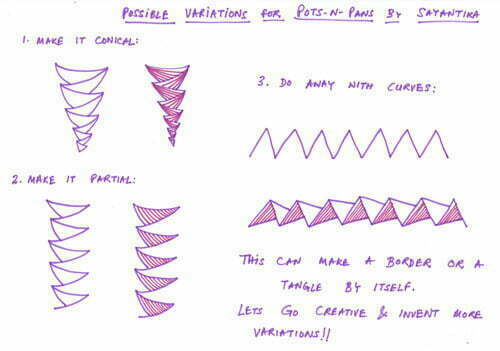 Sayantika Ray’s Pots-N-Pans tangle pattern reminded me of CZT Marie Browning’s Stishes (stacked dishes) tangle from her book, Time to Tangle With Colors. Marie’s book is one of my two favorite Zentangle® books, the other, as I’m sure you know, is Sandy Bartholomew’s Totally Tangled. There have been quite a few Zentangle-related books published since these two early ones, however the content and quality of these two still have them leading the pack in my view. Pots-N-Pans is a little different from Stishes and it’s worthy of adding to our collection. It makes a great border pattern and it can be varied in as many different ways you can think of to decorate the band around the edge of a (very small) plate or bowl. 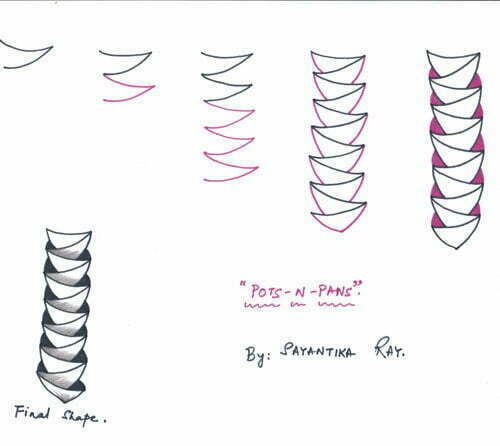 Here are Sayantika’s steps for drawing Pots-N-Pans . And here are Sayantika’s suggestions for ways to vary it. Check out the tag sayantikar for more of Sayantika’s patterns on TanglePatterns.com. This would be really good to take into schools to help children with disabilities. It has really helped me with my penmanship, it challenges my dyslexic brain, and for the first time, I feel like my art is pretty. This has brought me some of the greatest joy. This is a very heart felt, thank you.